I wonder how many kids are going through this but, like Ally, are too embarrassed or afraid to say something? There are many famous people who struggle(d) with Dyslexia...Albert Einstein, Whoopi Goldberg, Dav Pilkey, Pablo Picasso and George Washington to name but a few. This website (www.dyslexia.com) has common characteristics and what to look out for. 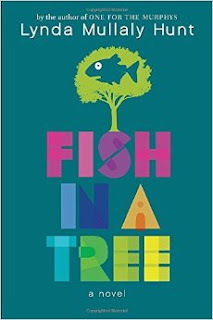 Fish in a Tree was chosen for the Global Read Aloud 2015. Sign up now to participate this fall. It's a wonderful collaborative project for your students. It'll get them excited about reading and writing. Here are some resources I found that can help with the Global Read Aloud. Book trailer video. If playback is a problem, try Teacher Tube. Playback shouldn't be a problem on school networks then! Click here for Teacher Tube. Click directly to the Global Read Aloud site here! A free Educator's Guide from Penguin. It was pretty good! Edmodo group for Fish in a Tree. Great place for collaboration and to hook up with other classes. I will add to this list as more things become available. 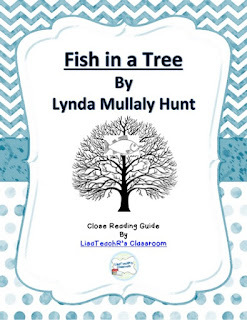 This is a guide to a close reading of this wonderful book, Fish in a Tree by Lynda Mullaly Hunt. It was first published in 2015 and has been a breakout hit. This is a great book. Read it to your kids/class today! Thanks for taking a look at my close reading guides on my TPT store! I'll see you at the Global Read Aloud!